Special Trade In Program Available! Other Notes: includes adult electrode pads, battery, carry case, quick reference card, and operator's manual. 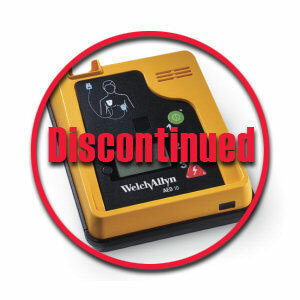 As of March, 2014, support for the Welch Allyn AED 10 & AED 20 devices will no longer be available. You can, however, take advantage of our AED Trade-In Program to purchase a new unit. Please call us at 800-544-0048 to discuss your available options today! When it comes to simplicity and compact design, the AED 10 Automated External Defibrillator (Backlit Display) from Welch Allyn is ready for rescue. With input from AED users at every level of skill, the AED 10 is designed for simple operation and quick deployment by the minimally trained or infrequent user. This is a factory NEW AED with a five-year warranty. Simply Stated... the AED 10 is Very Simple To Use. The AED 10 is ideal for the infrequent and basic rescuer. By following text messages together with voice prompts, virtually anyone can operate this lifesaving device. The AED 10 automatically determines if a lifesaving shock is required and protects against inappropriate delivery of a shock. Focused on simplicity, the AED 10 promotes a quick, no-hesitation response. One of the Lightest and Smallest In Its Class. At just 3.5 pounds (including the extended life, heavy-duty battery) the AED 10 is one of the smallest and lightest portable defibrillators in its class. The compact and lightweight design promotes quick and immediate deployment by virtually any rescuer - wherever Sudden Cardiac Arrest occurs. Dependable and Rescue Ready. AEDs are now being placed in a wide range of settings... and the AED 10 is leading the way by helping rescuers respond quickly to the emergency. This compact AED is available with a durable carrying case and can be stored in a compact wall cabinet (optional). High-performance, long-life, maintenance-free lithium batteries power the AED 10 - a battery technology specifically designed for applications where safety, reliability and long shelf life are of the utmost importance. And, the AED 10 is backed by a five year limited warranty for performance you can count on. Your Price: Special Trade In Program Available!